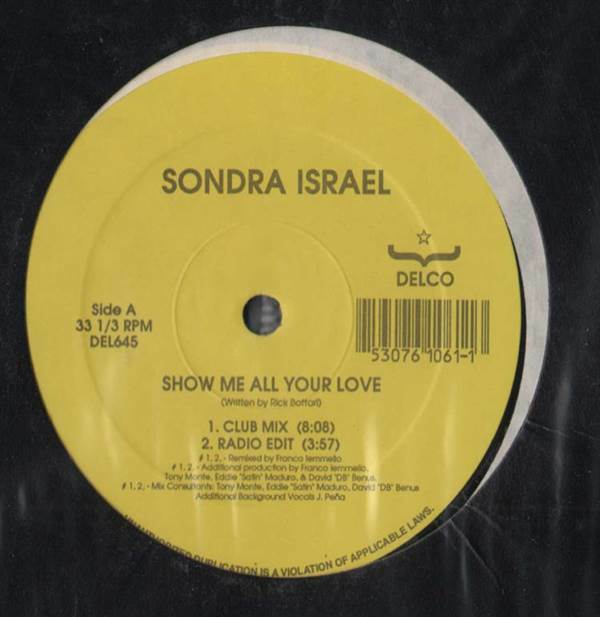 Sondra Israel - Show Me All Your Love 12"
FREESTYLE, Delco, USA, Unknown Year... Freestyle, House, Deep House with Show Me All Your Love (Club Mix), Show Me All Your Love (Radio Edit), Show Me All Your Love (Instrumental Club Mix), Show Me All Your Love (Original Freestlye Mix). Johnny O - I Wanna Make Love 2 U 12" India - The Lover Who Rocks You (All Night) 12" Loose Touch - Bad Of The Heart 12" Jose Cheena - Fly Tetas 12"
Sandee - You're The One 12" Joey Kid - Counting The Days 12" Natasha - Be Gentle With My Heart 12" G.T. - I Need You 12"